Frederick William (Bill) Englefield III passed away unexpectedly Saturday evening, November 3, 2018. Bill was born March 20, 1930 in Springfield, Ohio. He was the oldest son of three born to Rupert Englefield from England and Carolyn Garver Englefield. He was loved and appreciated by his brothers Richard Englefield (Pat) and Robert Englefield (deceased) (Ruth). He was the soul mate to his wife Janet Barton Englefield of Massillon, Ohio, and the love of her life from the time they first met over 65 years ago. He has always been her rock, her hero, and the wind beneath her wings. He will be missed beyond words by Janet and their three children Frederick William (Bill) Englefield IV (Kim), Cindi Englefield (Dave Koehler), and Ben Englefield (Lisa), and his grandchildren Frederick William (Will) Englefield V (Lindsay), Anthony Englefield (Amber Thompson), Carissa Richardson (Danny), Lauren Cox (Drew), Michael Lipaj (Alyssa), Ali Carter (Mike), Ashley Englefield-DeWitt (Neil) and Cody Englefield, as well as his 15 great grandchildren. He will also be missed by his brother-in-law and sister-in-law Bill and Lois Barton, many nieces and nephews, and their numerous close friends who he considered to be family. Bill was a proud graduate of Ohio University, where he received a degree in Civil Engineering and was a star football player. Upon graduating, he was a captain in the U.S. Army in the Korean War. In 1961, Bill founded Englefield Oil Company, which started from humble beginnings and was run by Bill and his wife Janet from the basement of their home. Today, the company is a third-generation family business and employs over 1,600 dedicated employees with revenues of over a billion dollars, a milestone that he could never have imagined when he fulfilled his dream of starting his own business. Bill was known as “Mr. E” to his loyal employees to whom he attributes the company’s success. He will be greatly missed by all at the company, especially by his secretary of many years, Dixie Loar. Throughout his professional life, he served as president of the Petroleum Marketers Association of America and the Ohio Petroleum Marketers Association. He was a member of the Society of Independent Gasoline Marketers of America, the National Association of Convenience Stores, Ohio Society of Professional Engineers, the Newark area Chamber of Commerce, the Newark Rotary Club and more. 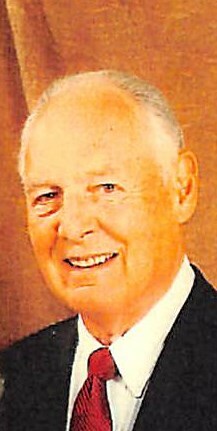 He was a 32nd-degree Master Mason, a longtime member of Moundbuilders’ Country Club and was an active member of the second Presbyterian Church in Newark for over 50 years. Over the years, Bill and Janet have been supportive to so many people and charitable organizations. Bill worked to make our community, state, and nation a better place for all to live and prosper. He believed in the free market system and was a true entrepreneur. He has touched the lives of many and was generous to all. He has been a leader and a mentor in the central Ohio area for many years, to his family and friends, and is an example of the kind of man we all admire. He wasn’t perfect, but he was honest, fair, and he put others before himself, always. He will leave a huge void that can never be filled. Bill Englefield was an exceptional man, husband, father, grandfather, great-grandfather and friend to all of us. He will be forever loved and never forgotten by his devoted family. A memorial service celebrating Bill’s life will be held at 1:00 P.M. Wednesday, November 7, 2018 at Second Presbyterian Church, 42 E. Church St., Newark with Rev. Todd Tracy as celebrant. The family will receive friends Tuesday from 2-4 and 6-8 P.M. at McPeek Hoekstra Funeral Home, 133 S. Prospect St., Granville. Private interment with full military honors will be held at Welsh Hills Cemetery in Granville. Memorial contributions may be made to Second Presbyterian Church, P.O. Box 428, Newark, OH 43055.